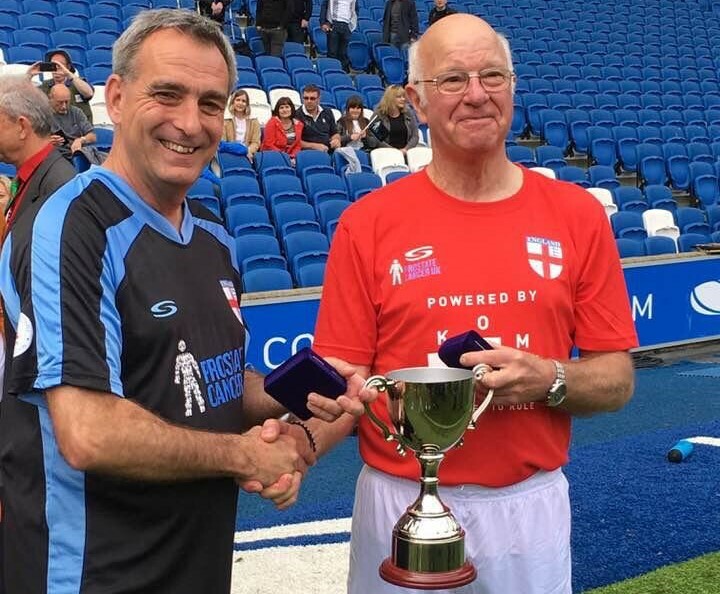 The first ever walking football international match earlier this month was just the latest stage in the game's rapid growth. Paul Carr, founder and Chief Executive of the Walking Football Association, tells ConnectSport what's next for the sport that's getting thousands of older people active. 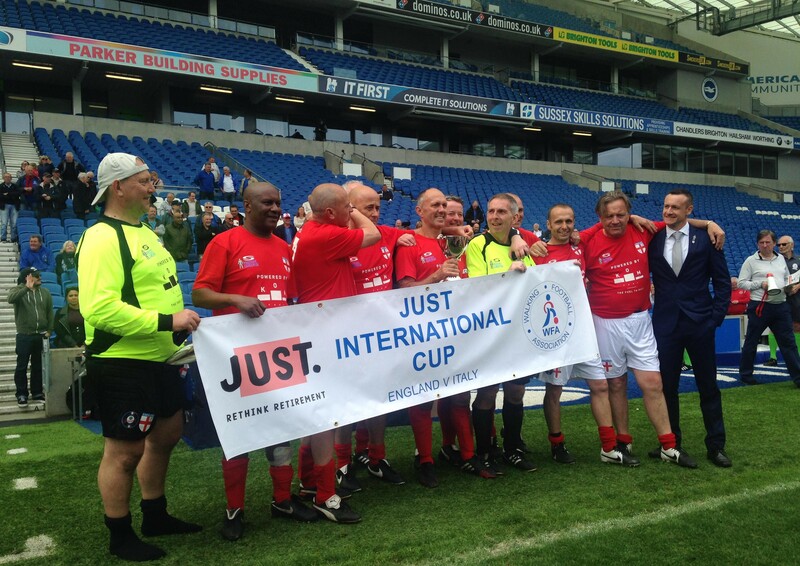 The walking football phenomenon hit a significant milestone a fortnight ago when its first ever international, between England and Italy, was staged at Brighton and Hove Albion's Amex Stadium. A certain 72-year-old Tommy Charlton, younger brother of 1966 World Cup winners Bobby and Jack, lifted the trophy. The success of the event has already led to plans for an England v Wales clash at an as-yet unnamed Premier League ground in August, then an eight-nation 2019 European Championship and 16-team 2020 World Cup, both to be held in England and potentially screened live on TV and online. Such expansion is being driven by the Walking Football Association (WFA), which was only founded 18 months ago. It had already introduced official rules and, with the help of Big Lottery funding, will have trained almost 100 referees by the end of June. There are now over 1,100 walking football clubs in the UK and 170 teams entered the three age-group categories of the WFA National Cup. Codifying the rules was an important step, as WFA chief executive and founder Paul Carr explained. 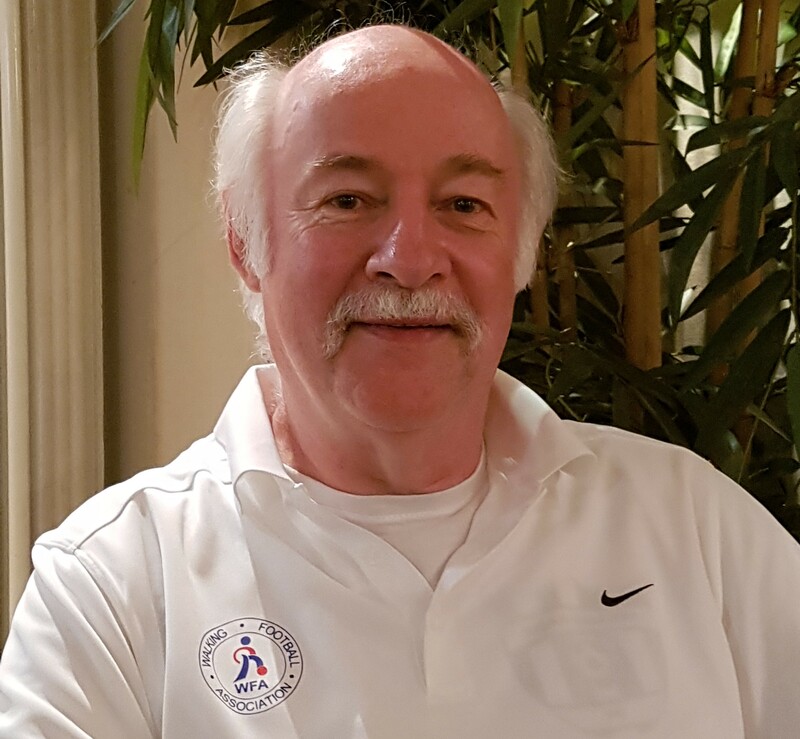 "I played for Wigan Walkers for three years but soon realised the sport needed some guidance and governance because at every tournament I went to they seemed to be playing different rules. It was very confusing and the players didn't like it. "I felt the sport was drifting and needed a dedicated national governing body, which is why I set up the Walking Football Association. We've now devised rules. There's no running, no contact, all free-kicks are indirect and the ball cannot go over head height. "It's all aimed at keeping the game safe and fun for all participants. It's generated a much more controlled environment and has helped shape the way the sport is going." The health benefits of the sport for the over-50s are numerous. Studies have shown positive changes in postural balance, blood pressure and resting heart rate, lowered cholesterol, improved blood sugar levels, bone density, improving reactions and reduced odds of suffering from type 2 diabetes. That's not to mention the social and mental health outcomes for players. Paul said: "We have obese players, those who have recovered from serious heart surgery, cancer and depression. It doesn’t matter what condition you are in physically or mentally, you can come along to play walking football and go away feeling good and with a smile on your face." The WFA currently has 30 volunteers and is unfunded, but is hoping to attract the interest of Sport England when suitable funding streams are made available. The sport seems to align perfectly with Sport England's priority of reducing the number of inactive older adults. "We're now in a position where we're certainly capable of making a significant difference at grassroots level in terms of our ability to deliver," said Paul. "The idea is to open walking football centres around the country and offer free sessions to as many people as possible. Clearly, that's going to cost a significant amount but we hope Sport England will join us on that journey. "What we find is that once people try the game, they love it and stay. It's a very addictive sport. What we need is investment to encourage older people to make that initial move off the couch. It's a huge challenge. We'd like to trial some local radio and TV advertising and put posters in doctors' surgeries so more people become aware of the benefits that can be derived from the sport." The WFA's marketing efforts will be boosted later this week by the launch of its official YouTube channel, which will feature highlights of that recent inaugural international, in which England beat Italy 3-0. "It was fantastic," Paul reflected. "The players were in these huge Premier League changing rooms and walked out to Champions League music. It was a real international experience at a proper stadium. Seeing Tommy Charlton lifting the trophy was superb – he's waited 50 years to do that!" Paul calls the WFA's next plans for a 2019 Euros and 2020 World Cup "ground-breaking and unique", explaining: "The Italy match was a good guinea pig to see whether we were capable of organising such an event. It was a great success and we've now definitely got the confidence to move ahead with the plans for the Euros and the World Cup thereafter." With a web of clubs, regional leagues and referees, the grassroots end of the game is ever-growing. The 'no contact' and 'no running' rules make it very inclusive with players ranging in age from 50 to 89 able to compete against each other. "It's a feelgood sport which enriches older people's lives," Paul concluded.